On our way to attend an event called, “Wine, Women and Song” at the quaint Hotel Cheval in downtown Paso Robles, we received a text that our friends, Rosemary and David, were going to be in town for the last few nights of their month-long “No Reservation Road Trip.” This two night get-a-way just got busier. As friends, our serious interest in wine began in the mid-eighties. Discovering new eating establishments and wines is what we are about when our paths cross in Paso. During lunch, I explained my plans to visit Barrel 27, a new winery that recently has received recognition for producing good value-priced Rhone-style blends. With everyone game after lunch, we headed east from town to hopefully, discover some new releases. Reviews from two major periodicals led me to the Barrel 27 ’08 “High On The Hog” White blend ($15) with ratings well into the nineties, medium-dry with layers of flavor. Aside from comparing “Hog” vintages ’08 and ’09, the plan was to taste their entire palate of single-varietal and blended wines. Barrel 27 Winery is located approximately one mile east of Highway 101, in the old industrial condo building that once housed Garretson Winery. It’s visible from Highway 46, but only accessible from Golden Hill and Union Roads Winemakers and friends, McPrice Myers and Russell From, drawn together by fate, are very upfront about their mission to respect the fact that hard working people should be able to drink high quality wine and still pay for the mortgage, car, kids and pets. With two whites, five reds and a moscato dessert wine, we set about to make our own judgments. 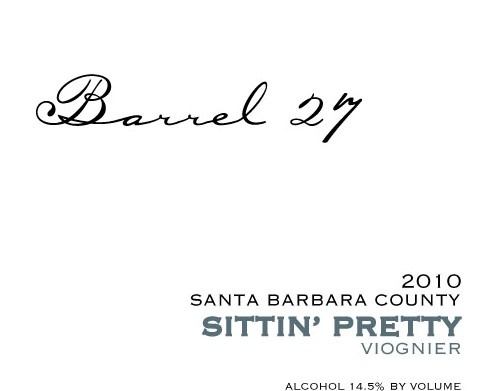 From 100% Santa Barbara County vineyards, their second release of “Sittin’ Pretty” Viognier 2010 ($18) delivered a nice blend of tropical and orchard fruits, but the rich, dense texture embodied the softer flavors of honey and melon. Although its price is average, this wine surpasses the standard in bouquet and taste. I was not surprised that the 2009 “High On The Hog” White ($16), primarily Grenache Blanc and Viognier, stood up to its predecessor in overall quality. Strong floral hints on the nose led to complex orchard fruit, honey and softened mineral flavors through a nice finish. This is a great food wine. Only their second vintage, Barrel 27’s single-varietal release of Grenache, a grape that, when done properly, can push the fruit forward without becoming overpowering. Exhibiting a beautiful deep, ruby color, the 2008 ‘Rock and a Hard Place” Grenache” ($18) was superbly balanced and full-bodied, delivering jammy fruit and spice on the palate. The wine was rated in the high eighties by Wine Spectator and Robert Parker. 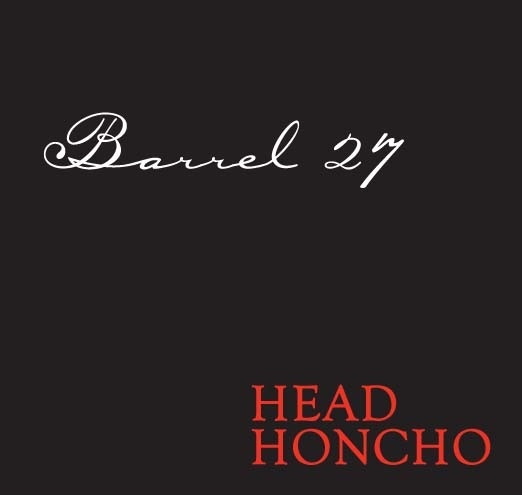 Smelling the bouquet of the 2007 “Head Honcho” Syrah($28) is a sensual task in itself. The longer you do it, the more aromas you discover. The texture (heavy on the tongue) and the balance of sweet and savory flavors, to be expected from quality syrah, combine with typical spice influences to signify a compelling wine even before you experience floral hints on the finish. A few bottles will rest in my wine cabinet for 6-12 months because everything about this exceptional wine signals that it will get better with time. After discovering Barrel 27 through their white Rhone-style blend, the moment has come to taste their only classic Rhone-style red blend, unavoidably mindful of comparisons with wines tasted during my recent trip to Chateaunef-du-Pape. The 2008 “Hand Over Fist” ($30) is Barrel 27’s highest rated wine, a classic Rhone-style blend of syrah (60%), Grenache (30%) and mourvedre (10%), nearly identical to those in the southern Rhone Valley. Quoting some knowledgable person, “this wine is big and bold from nose to finish.” The flavors are perfectly balanced, very jammy and liqueur-type in their intensity. I agree with the winery’s recommendation to decant the wine for at least an hour, thinking maybe two is better. A wine like this must have time to breathe and adjust to a new environment before it begins to “open up” to strangers. I propose another historical event, a blind tasting to be held in Avignon, pitting new Paso Robles Rhone-style whites and reds against legendary, century-old wines from Gigondas, Chateaunef-du-Pape and other southern Rhone Valley appellations. California is at the same stage in Rhone-style blend development as the Napa Valley was with Cabernet Sauvignon and Chardonnay during the 1976 Paris Tastings. How we would compare is still a question, but my instincts see us performing better than expected. Visualize the “Hand Over Fist,” The Saxum James Berry Vineyard Paso Robles 2007 ($67), Wine spectator’s 2010 Wine of the Year, the Tablas Creek Espirit de Beaucastel Paso Robles 2007 ($50) representing California going head-to-head with France’s Chateau de Beaucastel Chateaunef-du-Pape Hommage a Jacques Perrin Grande Cuvee’ 2007 ($535), Domaine les Pallieres Gigondas Terrasse du Diable 2007 ($28) and others. We have nothing to lose and everything to gain from such a contest. In conversations within French people about California, they always inquire how far I live from the Napa Valley. Paso Robles, as a winegrowing region, was not on their radar at all. A good showing from our stealth Paso wines would send shock waves through the world wine business. The tasting concluded with the 2008 “Head Over Heels” Moscato ($23), Barrel 27’s sweet, slightly sparkling, dessert wine. To me, an apéritif or dessert wine must stand on its own, shine with or without the accompaniment of everything from crème brulee to sharp cheeses. The “Head Over Heels” has complex flavors of orchard fruits(peach), honey and melons. However, minerality and nice floral hints on the finish build a case that it can be THE dessert if necessary. I wrote about all Barrel 27’s releases because I like them all. For those beginning to research and target wines, they offer very good quality at a decent value. My recommendation is to discover and enjoy their wines before the entire area does. Real or perceived scarcity can result in higher prices. Our rendezvous with friends also led to some “catching up” over a nice lunch at Thomas Hill Organics and another memorable dinner at “Artisan,” arguably Paso Robles best restaurant, accompanied by a 2005 Leona Valley Winery “I+L+Y=O” Bordeaux blend from my cellar. As for the “Wine, Women and Song” event, that’s another story. This entry was posted on Friday, July 29th, 2011 at 4:19 am	and posted in "Artisan" Paso Robles, 2007 "Bull By The Horns" Red Wine, 2007 "Head Honcho" Syrah, 2007 "Right Hand Man" Syrah, 2008 "Hand Over Fist", 2008 "Head Over Heels" Moscato, 2008 "Rock and a Hard Place" Grenache, 2009 "High On The Hog", Barrel 27 Winery, Thomas Hill Organics, Wine. You can follow any responses to this entry through the RSS 2.0 feed.